Our oldest child is starting kindergarten today. We are super excited for her. We are also completely conflicted about it. And not (just) because she’s growing up so fast. You see, where we live, the school eligibility cut-off is September 30. She misses it by 16 measly days. Years ago when she started daycare, she ended up in a room with kids a little older than her. She thrived in that environment, so we kept her with the class “ahead” for as long as we could. But a year ago, even though both we and her PreK teachers felt she was ready on all levels, she couldn’t go on with her friends to kindergarten. What really burns us about this is that we didn’t have a choice. We get that there has to be some sort of cut-off for logistical reasons, but September 30 (neither the first day of school nor the end of a calendar year) seems completely arbitrary, as does the fact that if our kid was born 17 days earlier we’d have been able to choose whether to redshirt her or not. Thanks to this arbitrariness, she’s been functionally, and forcibly, redshirted. Much ink has been spilled about the relative age effect on kids’ school performance and life outcomes since Dubner and Levitt popularized redshirting with Freakonomics and Malcolm Gladwell kicked off a redshirting trend with Outliers. Most people we talk to about this think it’s a good thing for kids to be among the oldest in the class. There are studies to back them up, finding that kids slightly older than their classmates tend to enjoy an academic, leadership, social confidence, and/or an athletic edge, especially in elementary school. But there is also a ton of research showing that any short-term benefits of redshirting disappear over time. Several studies have found that there is no lasting statistically significant academic benefit from redshirting. Other studies show that, as redshirted kids get older, they actually are worse-off, have more behavioral problems, and a greater tendency to lack academic motivation, disengage, and perform worse academically than their classmates, presumably a consequence of being bored in school and/or not connecting with younger classmates. There is also research showing that younger-than-average students benefit from the positive, lasting effects of learning early to overcome obstacles from having to strive to keep up with their peers. Still other research shows that these benefits persist throughout life, from college grades to salaries. At the end of the day, though, any study is just statistics. Our kid is not a statistic. Plus, we’ve now got our own firsthand research to draw from – research specific to her. We’ve gotten the chance to observe our daughter as both the youngest kid in the class (PreK take 1) and the oldest (PreK take 2). The difference was dramatic. When she was with kids on average 6 months older – up through her first go-round at PreK – she built deep, lasting relationships with her classmates, boys and girls. This relationship-building – the relationships themselves – persisted even when she changed schools and joined an entirely new group of kids, and even after her friends left for kindergarten. This past year (PreK take 2), she formed no comparably deep relationships with her classmates, even though she’d known several of them for years. She was so much more emotionally mature than many of her PreK take 2 classmates that, for the first part of the school year, several of them called her mommy. And because she had long ago mastered the PreK material, she basically functioned as “teacher’s helper” for much of the year. It’s great that she got a chance to work on leadership skills. But it was obvious to us that she simply wasn’t engaged or challenged at school – either social-emotionally or intellectually – anywhere near the level she had been her first go-round at PreK and during the years before. As a result, her growth rate of social-emotional development flattened out this past year, even regressed in some ways as she began mimicking the attention-getting behaviors of the younger kids surrounding her – more whining, more defaulting to tears instead of using her words when she’s only mildly upset, more baby talk. The maturity difference is particularly noticeable in comparison to her friends who moved on to kindergarten last year, even those only a few weeks or months older than she is. Meanwhile, because she was bored intellectually, she taught herself to read and write (with our help, of course), and is already doing both of those things pretty proficiently. This all worries us. We don’t care what grade she’s in or what year she graduates high school. We’re not focused on her being first in her class or getting slotted into the gifted and talented track. More than anything else, we just want for her to be engaged with both her classmates and the material, to be constructively challenged to learn and to grow throughout her schooling, and to be comfortable with digging deep, not just doing what comes easy. And we just haven’t seen that this past year. So now that she’s finally entering official “school,” we’re eager to make sure she gets back on track. Our plan: enlist her teachers as allies. Our first step is to share our concerns with her teachers, ask their advice, and find out what academic and social-emotional competencies they expect graduating kindergarteners to have. We’re going to ask them to keep an eye on her during the first few weeks and months to see if kindergarten really is the right fit. We’ll observe her ourselves as well. 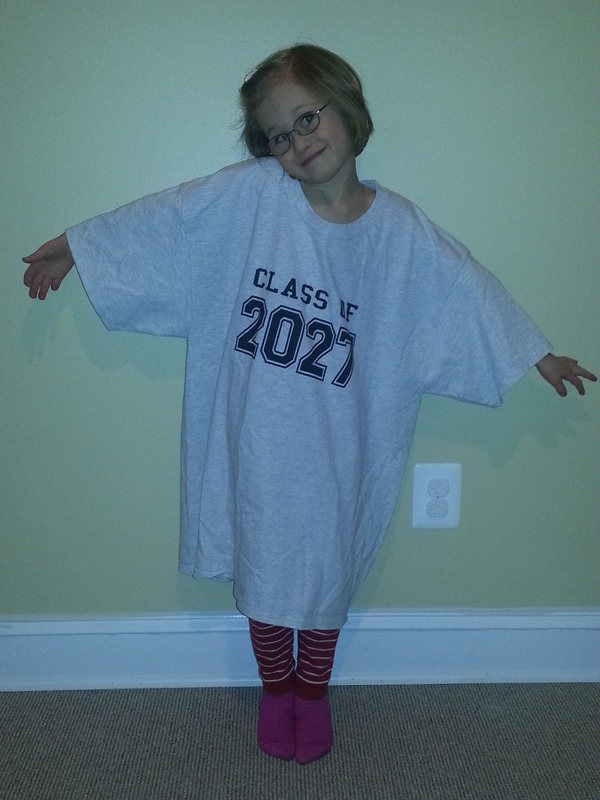 Because kindergarten may indeed be the right fit for her – last year might have been a fluke. Or it may not. But we want to know sooner rather than later. Because if she would indeed benefit from skipping a grade, we want her to do it now, not later on when the academic and social stakes are higher. What do you think? Have you bumped your kid a grade ahead? Redshirted your kid? Got any advice for us? It really is a humdinger – both my kids are July bdays, so will be amongst the youngest in their years, and over here in the UK, you’re not allowed to redshirt – whatever year you’re born into (cutoff Sept 1) is the year in which you stay. Already I’ve seen evidence that while Z may be doing well *for her age* she is only average as compared to the *rest of the class*. This impacts which level she’s streamed into and therefore the levels of the kids around her. Hopefully, as you said, it’ll even out in the end, but I had a great experience being older (Dec bday), at least until the last year of school, and wish my kids weren’t so young in their year. I have a December birthday and missed the cutoff in my elementary so I started Kindergarten at age 5, and then they skipped me to first grade after 2 weeks. I have mixed feelings about skipping a grade and being the youngest in class. I don’t think it hurt me, but do think there were times that I struggled to fit in socially in elementary school, which may or may not be related to not doing Kindergarten there. On the other hand, that may have been the motivation for me to do well in school.